What Does an Egg Farmer Do? Egg farmers are responsible for the care and maintenance of laying hens used as part of an egg producing poultry farm. They can work for large commercial operations or run an independent family farm and can have anywhere from a few dozen to many thousands of hens. There is a continuous cycle of bringing new hens in when they reach production age and removing older birds from the flock as their production levels decrease. Egg farmers may choose from several management systems for their egg production operation. Free-range operations allow the hens to access open-air runs. Cage based operations are more cost-efficient, allowing a greater population density and increasing the ease of egg collection. 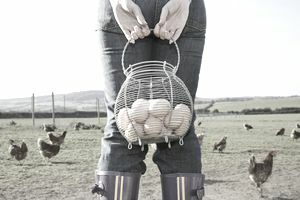 Some producers run organic egg operations, which feature free-range conditions and heavily restricted use of antibiotics and additives. Poultry producers also may work with veterinarians to provide proper health care to their animals, especially with regard to establishing a vaccination program and treating flock illnesses as they arise. Animal nutritionists and livestock feed sales representatives may also contribute to developing nutritionally balanced rations for the hens. The salary an egg farmer earns can vary widely based on the number of hens kept, the level of egg production, and the success the farmer has in marketing their product to consumer and commercial markets. Chicken manure may also be collected and sold for use as fertilizer. This can serve as an additional source of revenue for some egg farms. Egg farmers must deduct a number of expenses from their net profits to determine their final profits for the year. These expenses may include a number of costs for labor, insurance, livestock feed, fuel, supplies, veterinary services, waste removal, and equipment repairs or replacement. Education: A growing number of poultry farmers hold a two or four-year degree in poultry science, animal science, agriculture, or a closely related area of study. Coursework for such degrees can include poultry science, animal science, anatomy, physiology, reproduction, crop science, genetics, farm management, technology, and agricultural marketing. Experience: Direct, hands-on practical experience working on a farm with laying hens is very important for aspiring egg farmers, as they can learn the business from the ground up. Most egg farmers grow up on a farm, apprentice with an established operation, or produce eggs as a hobby before venturing out on their own to run a large scale egg production facility. Many aspiring egg farmers also learn about the industry in their younger years through youth programs. These organizations, such as Future Farmers of America (FFA) or 4-H clubs, give young people the opportunity to handle a variety of farm animals and to participate in livestock shows. Physical stamina: Egg farmers must be able to be on their feet for long periods of time, lift, and bend—especially those working on small farms. Interpersonal skills: They must be able to effectively supervise and work with others on the farm. Analytical skills: Egg farmers must monitor and assess the health of the hens and quality of the eggs they produce. The U.S. Bureau of Labor Statistics projects that the number of job opportunities for farmers, ranchers, and agricultural managers will decline 1 percent through 2026, which is slower than the overall employment growth of 7 percent for all occupations in the country. This is due primarily to the trend towards consolidation in the farming industry, as smaller producers are absorbed by the larger commercial outfits. Depending on the type of egg production system, work may occur outdoors in varying weather condition, or indoors in close quarters. Egg farmers must be prepared for the demands that they will face in either sort of setup. The hours that an egg farmer works may be long, usually more than 40 hours per week, and work is often necessary on nights and weekends.